Traditional Swiss Health System midwifery recipe. 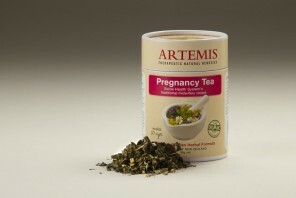 Also supports uterine recovery after birth. 100% certified organic herbs of: Raspberry leaves, Lady’s Mantle, Nettle, St John’s Wort, Lemon Balm, Horsetail, Yarrow. No caffeine, gluten, sugars, artificial flavours, colours or preservatives. For full priming, strengthening and nourishing benefit for mother and baby take 1-3 cups daily from the 4th month onwards and 3 cups daily from the 5th month onwards. Take as a healthy ‘pick-me-up’ instead of tea or coffee. Continue after birth for a few weeks to ensure a speedy uterine recovery and ease of breastfeeding. Take 1 heaped teaspoon (1g) per cup (150ml), place into infuser, plunger or china pot, pour over boiling water and leave to infuse for 5-10 minutes. Do not microwave. This is a traditional European midwifery recipe that is officially endorsed in Switzerland in obstetric care. It is considered to be very safe as an effective support for the pregnant woman. It is especially valuable as a birth preparation as it helps to build up the strength of the uterus for effective contractions. Use as directed. If you are on prescription medicines (re: St. John’s Wort) or if you have concerns about your pregnancy see your health professional. At the recommended dosage no clinically relevant herb-drug interactions have ever been shown. Not recommended if you have allergies to any of the ingredients. Pregnancy – safe within range of recommended dosage. Breastfeeding – safe within range of recommended dosage. No restriction on long-term use. To avoid external contamination close container immediately after use. Keep away from heat and moisture. Store in fridge in hot and humid climates. Note: This product is not intended to diagnose, treat, cure or prevent any disease or medical condition. Individual results may vary.